On Friday, German Chancellor Angela Merkel asked Greek President Karolos Papoulias what he thought of the idea of holding a referendum on Greek membership in the euro. This lead to another sell off market. On Saturday, A Merkel spokeswoman said the report to hold referendum wasn't true. Between December to May this market kept buying without thinking and later realised it way ahead of where it should be. 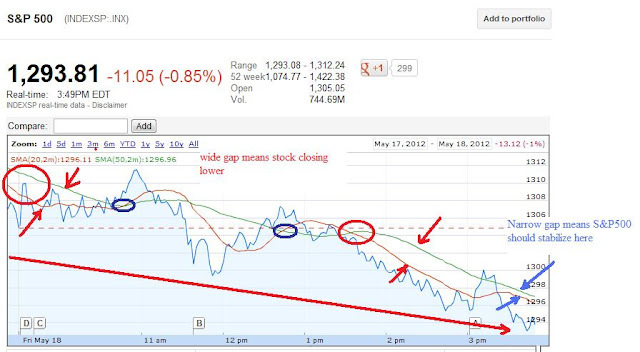 Now its the opposite, its sell first without thinking and so we should get a dead cat bounce rally tomorrow. 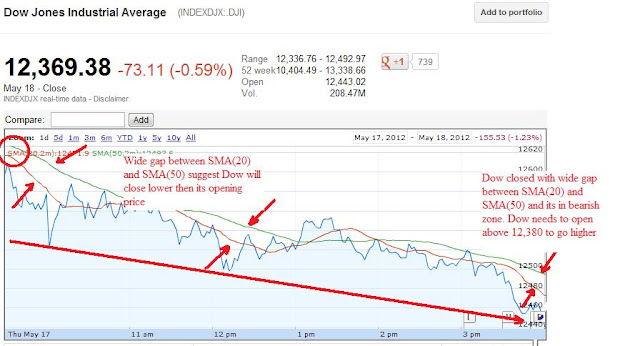 This week is a consolidation week so Dow and S&P500 will recover little. 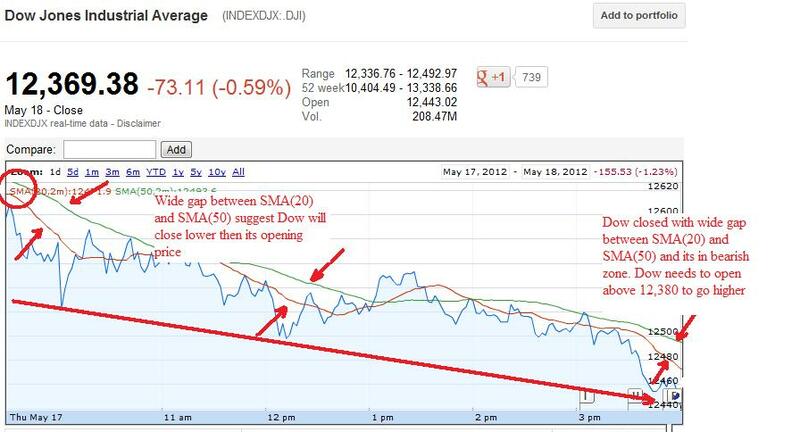 Tomorrow market is expected to bounce back at the open unless futures is down sharply. 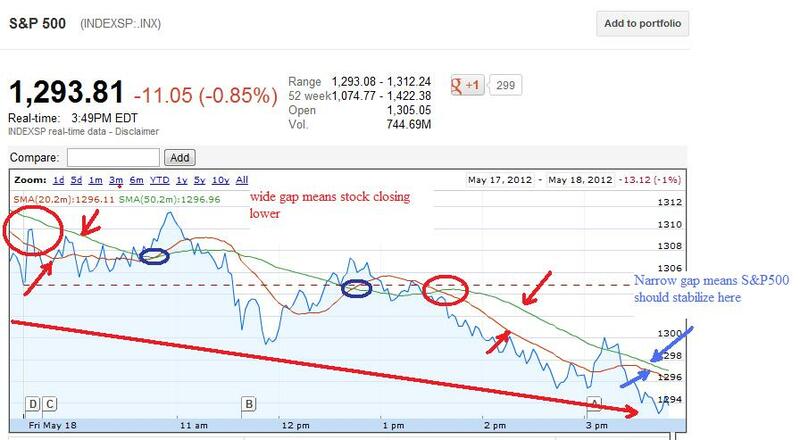 Rest of the day pattern will depends on the news out of Greece, Spain and Germany. G8 meeting was failure as expected. Its time to buy ERX ($36 or below) or any oil related stock on weakness or atleast keep it in your watchlist, as you remember "EU foreign ministers decided on 23 January 2012 to ban new contracts to import petroleum and petroleum products from Iran and to end existing contracts by 1 July 2012." For upside dow needs to break 12376 followed by 12449, while for downside dow needs to break 12332 followed by 12275. 12,215 is most important resistance in Dow, if it breaks this market is in big trouble. For upside S&P500 needs to break 1300 followed by 1304, while for downside S&P500 needs to break 1288 followed by 1285. 1282 is most important resistance in S&P500, if it breaks this market is in big trouble. There is no important Economic data out of US. But there is 3month, 6month and 12 month auction in France which very important at 2 am EST. For day trading watchout BIDU, AAPL, PCLN, MA, V, FAS, FAZ, TZA, TNA, TVIX, XIV, SVXY, UVXY, VXX, SPY, DIA, GLD, AGQ, INFY (remember volatility is not a long term investment option use it for strictly day trading) VIX is in Backwardation, so any bad news could lead to big rally in UVXY, TVIX, VXX. But this could change if S&P500 opens higher by 5 point. Just becareful with your investment, don't lose money in this volatile environment. Use stop loss.